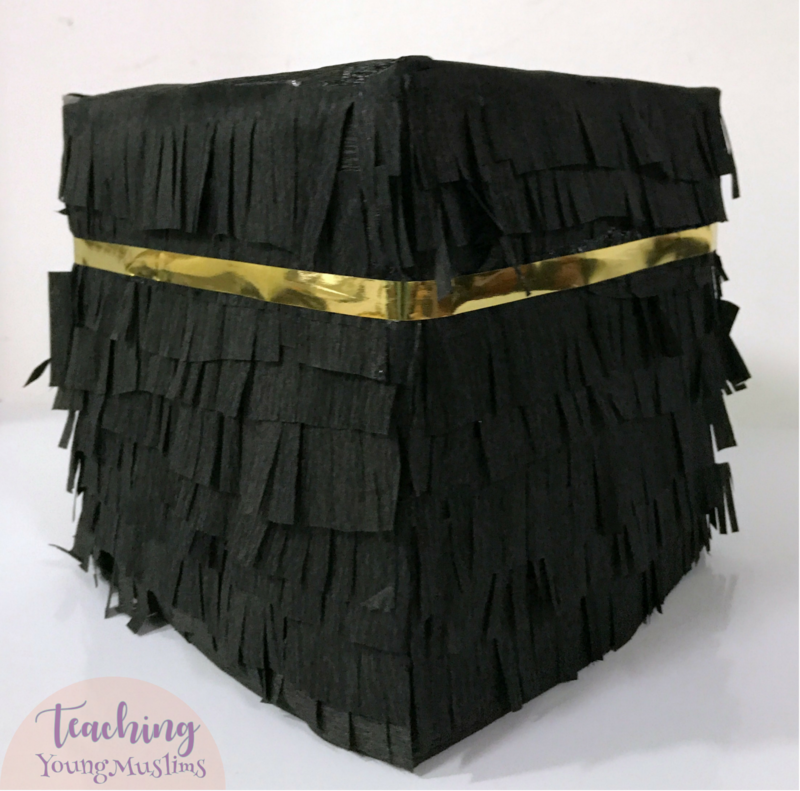 After being inspired by Oh Happy Day to create a crescent pinata for Eid-ul-Fitr, I loved the method so much that I decided to make something for Zil Hajj and Eid-ul-Adha too! To assemble, I first set up the four sides of the Kabah, and secured them with tape. I then covered the top and the sides with black tissue paper. For the piñata effect, I used strips of black tissue paper, and cut a fringe on one side. I started gluing the fringe up each wall, starting at the bottom. After all the sides were covered with fringes, I wrapped a golden ribbon around towards the top of the model. Ta-da! One thing that I learned from the crescent was that the cardboard box I used was WAY too thick. It took forever to cut, and our hands were hurting until the next day. This time, I used much thinner cardboard, which was easier to cut and easier to assemble. Another thing that I learned from the crescent was that having a background of the same color made it a lot easier when adding the fringe, because this way, the fringe doesn’t have to be perfect. So I made sure to wrap my cardboard Holy Kabah with black tissue paper before adding the fringe. This was SO much easier than last year’s model of the Holy Kabah, for which I used slippery plastic. Never again! What other methods have you all used to create models of the Holy Kabah? Let me know in the comments section below or by sending me a message!